What makes a great pension scheme? If you want to ensure that your employees have access to great pension services while you concentrate on running your business, you need look no further. Offers a highly governed pension scheme with flexibility for you and your employees which means they can work towards the retirement they deserve and you know that every aspect of running the pension scheme is taken care of by experts. Is a defined contribution Master Trust which is overseen by an independent board of Trustees and strategists who work diligently to ensure that Crystal remains the best pension solution available to its clients. Offers bespoke pricing packages to ensure that you and your employees always get the best deal. Provides dedicated support so whether you are new to pension provision or have a complex set of historic pension arrangements to transition we will be there at every step. Provides a dedicated Client Manager to ensure that after you join, there is always someone on hand to answer any questions. Helps employees to a better retirement outcome and also provides retirement benefits with its innovative range of drawdown options, so your employees are taken care of from the moment they begin saving through to receiving regular payments. To find out even more fantastic reasons to use Crystal as your complete pension solution CONTACT US. Pensions is a fast paced industry with regular changes to legislation, which can become even more acute with a changing Government. Employers and Trustees can spend inordinate amounts of time planning for change, communicating effectively and managing risk. This is not only time consuming but costly too, with legal advice, system changes and communication reviews to name but a few. There is a whole new world of accountability for master trusts (schemes for multiple, unconnected employers) detailed in the Pension Schemes Act 2017, with a new authorisation regime that clearly aims to remove some weeds from the pensions industry, those badly intentioned and poorly run master trusts. These increasing requirements for master trusts will inevitably cascade to other Defined Contribution schemes in due course as members’ expectations of a well-run pension arrangement increase and the Pensions Regulator uses its increasing powers to raise the standards for all. There is a real danger of schemes falling behind and exposing members to risks. Good governance keeps a scheme afloat; great governance keeps a scheme striving forward for the best outcomes for members. Crystal utilises in-house governance experts to create a structure around and with the Trustee, to ensure watertight risk management. Pensions is too complex a matter to document in one long booklet or retirement communication, it is about getting the right message at the right time, drip feeding financial education throughout membership and focusing on the key matters at high engagement points. How to approach engagement is a matter widely discussed across the pensions industry but Evolve believe you must utilise technology. There are still going to be members who would like a piece of paper but this is rapidly reducing– over 80% of adults in the UK use internet daily, we are slaves to our smartphones. Employers are also vital in this chain of engagement, Crystal promotes partnerships with our clients so we can work together to educate and inform members, which ultimately will improve their outcome in retirement. Keeping up with legislation and the raised benchmark for pension schemes is going to prove too much for many and the ‘do it later’ approach will simply not be good enough. Crystal has been positioned as a real option for those employers and Trustees who need to reduce the risks, resources and costs associated with running their own pension arrangement. Governance is looking after a pension scheme correctly at every level of the operation and becomes the mortar that keeps a scheme together but it must be structured, regular and documented. Well intentioned employers, scheme managers and Trustees may be attempting to monitor providers, review reports and set up policies but without a clear strategy, cracks will appear. Trustees are often the first focus, they are the directors of governance but truly great governance needs specific governance strategy, robust framework and application across all levels of the operation of a scheme. Governance is not just about compliance and staying in line with the regulations, it is enabling the Trustees and other key individuals to make clear and educated decisions in a risk controlled environment. Just ticking the box is not good enough. Successful engagement is not about creating experts but encouraging better decision makers. Crystal ensures member and employer engagement is a strategy discussed at all levels, from Trustees through to administrators, ensuring Crystal members feel at ease with the decisions they make and understand how to get the most from their membership. Members can be saving in a pension scheme for in excess of 40 years. Alongside banking and mortgages this is the longest financial relationship individuals will have. The investment options members are offered need to be risk managed, diverse and responsive to the changing world. When members enter a pension arrangement they are expecting to save for a pension, an income in retirement. What they are actually getting is a way of saving until they decide to leave employment and then, in most cases, sent out into the open market to find their own way to a retirement income. Pensions Freedoms came into force in April 2015, yet few schemes have implemented changes as a result and in time this lack of action could manifest itself as a real risk as members ask why they weren’t given better options. Crystal offers award winning investment choices and has been providing members with access to comprehensive drawdown options built within Crystal since Pensions Freedoms came into force, enabling members to take advantage of the flexibility available and make retirement work for them. Become a Crystal Partner and safeguard your employees’ pension savings for less. As a Trustee of an established and successful pension scheme, the process of consolidating your scheme to be part of a bigger arrangement may be a big step to take. After years of providing valuable benefits to its members, starting a new arrangement and/or transferring members ensuring governance levels are of the highest standard is the main concern for Trustees. Crystal is a Qualifying Workplace Pension Scheme that is governed, managed and administered by Evolve and sits alongside the award-winning Master Trust, The Bluesky Pension Scheme (Bluesky). Crystal has a Governance Team provided by Evolve and appointed Trustees who all have significant experience in the pensions industry, covering governance, administration, investments and finances. These Trustees all participate in industry events and training, providing valuable insight into our ever-changing industry. A dedicated Client Services Manager will be appointed to control the process during every step of the transition. To discuss your scheme requirements, such as branding and investments, please contact us. As an employer participating in an established and successful pension scheme, the process of consolidating your scheme to be part of a bigger arrangement may be a big step to take. You may have been administering and running payroll extracts for your pension scheme ‘in house’ or have had a long-standing relationship with an external provider. Crystal is a Qualifying Workplace Pension Scheme that is governed, managed and administered by Evolve, sitting alongside the award-winning Master Trust, The Bluesky Pension Scheme (Bluesky). Crystal is a net pay arrangement, which means that pension contributions are deducted from earnings before they are taxed. If an individual does not pay tax, they will not benefit from the tax relief that a tax payer would. Using Crystal will provide you with an exceptional service, including administration and processes that cover over 600 employers already. The administrators to the Scheme already work with many different types of employer with varying payroll providers. Crystal has a Governance Team, provided by Evolve and appointed Trustees who all have significant experience in the pensions industry covering governance, administration, investments and finances. These Trustees all participate in industry events and training, providing valuable insight into our ever-changing industry. A dedicated Client Services Manager will be appointed to control the process during every step of the transition. To discuss your scheme requirements, such as branding and investments, please contact us. You can assist your clients who wish to ‘consolidate’ their existing pension schemes and provide a high quality service, by becoming a Partner of Crystal to provide ongoing pension benefits. Crystal was the UK’s first trust based drawdown scheme and is governed, managed and administered by Evolve, sitting alongside the award-winning Master Trust, The Bluesky Pension Scheme (Bluesky) and is now open to existing schemes and a Qualifying Workplace Pension Scheme, providing a complete consolidation package. Your client may well run an established and successful pension scheme and the process of consolidating the scheme to be part of a bigger arrangement may be a big step to take. The information on the Crystal website is not advice, it is provided solely as information for individuals to refer to when they make their own retirement investment decisions. Crystal uses investment linked products managed by AB Global’s Retirement Bridge (RB) strategy and LGIM and therefore, investments may go down as well as up. This could be as a result of the market going down or because investments do not perform as well as expected. There are no guarantees for returns but the Trustee set targets for the investment managers who are reviewed on a quarterly basis and are supported by independent investment consultants and Evolve’s Strategic Team. There is no guaranteed minimum income pay-out from any Crystal option. The income pay-out rate will vary from year to year and doesn’t guarantee that individuals will have sufficient income at 75. There is no guarantee the level of income quoted will be achieved. The value of investments may go down as well as up, annual income amounts may also go down as well as up. In extreme market cycles income may not increase in line with inflation and the spending power of income will reduce. The investments and/or investment services referred to may not be suitable for all investors. If individuals are unsure of the suitability of any retirement investment, they should contact an Independent Financial Adviser for further information. AB Global funds and LGIM funds are offered under a pooled custody arrangement. The Trustee of Crystal access the service by entering into a discretionary investment management arrangement with both AB Global and LGIM. Each account in the series is comprised of a combination of underlying funds managed by AB Global and LGIM, along with other fund managers and direct investments. All funds are protected by the Financial Services Compensation Scheme (FSCS). Crystal offers 6 first class investments strategies. Each strategy is designed to be available as a default choice, then the other 5 as self-select options for members. Each strategy is monitored by the Trustee, Investment Committee and Investment Consultant which ensure the funds are managed effectively and perform in line with the Trustees expectations. Target Date Funds are a series of funds tailored to a member’s retirement date. Each Target Date Fund is a diversified investment fund, which adjusts with age and proximity to retirement. It aims to give the highest possible pension income with a high level of risk management. The Target Date Funds are provided by AB Global, who oversee the strategy ensuring that the mixture of assets is appropriate to the investment markets on a daily basis, using a Mobius Life investment platform. With an average performance target, the risk rating of the fund is low to medium. The lifestyle strategy uses 3 building blocks provided by Legal and General Investment Management (LGIM). It is designed to automatically manage members’ investments, with an aim to start protecting their funds from the age of 50 up to the age of 75. The chart below outlines the overall strategy, which is appropriate throughout an individual’s period of saving. The lifestyle strategy does not contain traditional lifestyling to align a member’s investments to a specific retirement age, normally 65, with no further strategy beyond that point. It is designed to maximise investment growth in the member’s early years, then gradually switch into other asset classes to reduce exposure to the stock market. With working patterns changing and retirement ages variable, the lifestyle strategy allows members the freedom to access their savings anytime from age 55, in the knowledge that their investments are continually monitored and adjusted, up to the age of 75. Active Target Date Funds are a series of funds tailored to a member’s retirement date. Each Target Date Fund is a diversified investment fund, which adjusts with age and proximity to retirement. It aims to give the highest possible pension income with a high level of risk management. The Target Date Funds are provided by AB Global, who oversee the strategy ensuring that the mixture of assets is appropriate to the investment markets on a daily basis, using a Mobius Life investment platform. 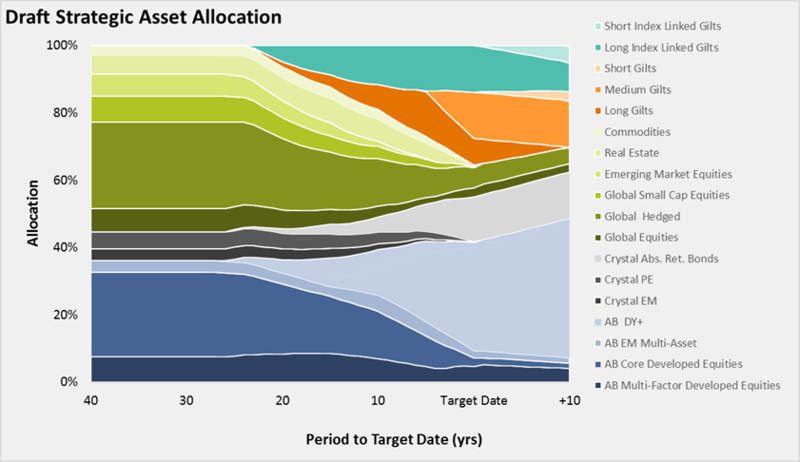 Around 30% of the Active TDFs use ‘active’ management where AB Global is using its investment expertise to outperform the market which may result in better outcomes taking on a slightly higher level of risk compared to standard TDFs. Please note that the Active TDF strategy is still being developed by AB and as such, the formal launch of this strategy has been delayed until 2019. With a high performance target and a high level of strategic management, the risk rating of the fund is medium. 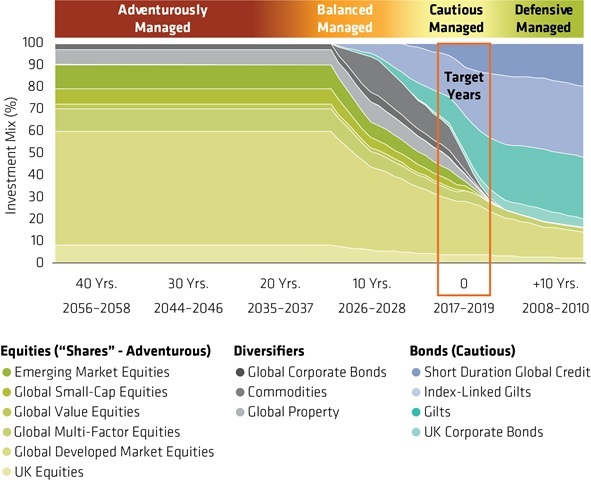 The Active Fund uses a snapshot of AB Global’s Active TDF strategy which includes a high level of active management but does not de-risk as the member gets older. A typical breakdown of the assets are shown in the graph below. Please note that the Active Fund strategy is still being developed by AB and as such, the formal launch of this strategy has been delayed until 2019. With a high performance target, the risk rating of the fund is medium to high. Target performance of 1% above inflation. The Protection strategy uses an element of the Lifestyle strategy but does not de-risk as the member gets older. With a low performance target, the risk rating of the fund is low. The Growth strategy uses an element of the Lifestyle strategy but does not de-risk as the member gets older. Crystal Aqua is designed for individuals to choose a regular monthly income from their retirement fund. Payments from Crystal Aqua will be made monthly, with a minimum income level of £100.00 per month. 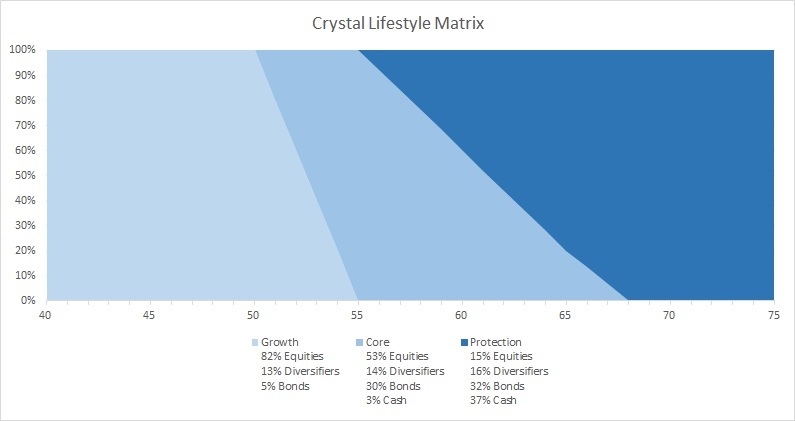 Individuals have the option to change their level of income annually, or move their fund to another Crystal option if they wish to at any time. Taking a regular income from Crystal Aqua will reduce the level of funds invested. The Crystal Quotation Tool can provide an estimate of how long the fund is expected to last. 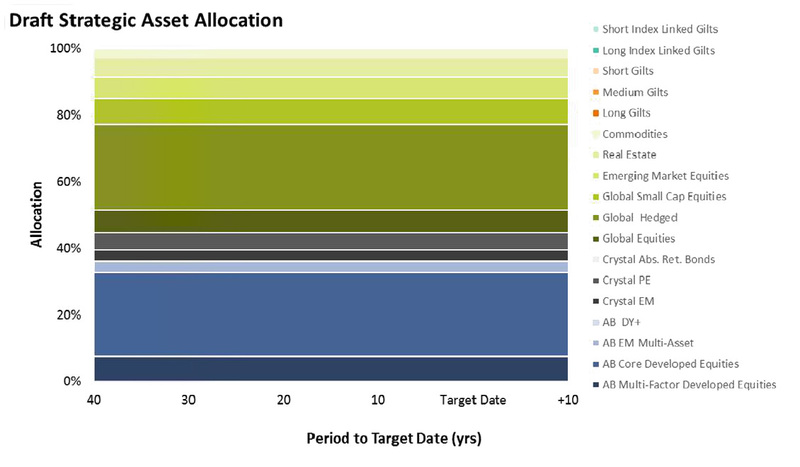 Crystal Aqua will be invested in a mix of assets (as detailed on the asset allocation pie chart), known as a Target Date Fund. This offers the potential for growth to protect income against inflation. The mix of assets also spreads the risk across a number of investment classes and aims to grow the Fund, in a controlled manner, to allow for flexible withdrawals whilst retaining a benefit to be passed on to dependents. Individuals with funds remaining will be able to close down Crystal Aqua, switch to another option within Crystal or buy an annuity on the open market. There are no ties to Crystal Aqua and individuals can change their mind at any time. It must be remembered, Crystal Aqua uses an investment linked product managed by AB Global and therefore, investments may go down as well as up. This could be as a result of the market going down or because investments do not perform as well as expected. The Trustee monitor investment performance regularly and is supported by independent investment consultants and Crystal Operations. For further information about investment risk please click here. Crystal Jade is designed to allow individuals to choose a monthly income, similar to that of a non-escalating joint life annuity. Funds will be invested in a mix of assets including approximately 40% company shares and 60% bonds (as detailed on the asset allocation pie chart) which offers the potential for growth to protect your income against inflation. The mix of assets also spreads the risk across a number of funds and aims to manage the remaining Funds in a sustainable manner. At any age up to 75, individuals can exit Crystal Jade and switch to another option within Crystal or buy an annuity on the open market. There are no ties to Crystal Jade and you can change your mind at any time. Crystal Jade income will be recalculated in April each year, with payments changing from July if applicable, taking into account the previous year’s investment performance and will provide a monthly pay-out via the payroll on the last working day of each month following retirement. It must be remembered, Crystal Jade uses an investment linked product managed by AB Global and therefore, investments may go down as well as up. This could be as a result of the market going down or because investments do not perform as well as expected. Crystal Onyx is designed to maintain the level of the investment an individual makes at retirement and pay out a monthly income. Funds will be invested in a mix of assets including 30% company shares and 70% bonds (as detailed on the asset allocation pie chart) which offers the potential for growth to protect your income against inflation. The mix of assets also spreads the risk across a number of funds and aims to manage the remaining Fund retaining the original value of the investment with a lower payout ratio than Jade. Individuals can exit Crystal Onyx, switch to another option within Crystal or buy an annuity on the open market. There are no ties to Crystal Onyx and individuals can change their mind at any time. Crystal Onyx income will be recalculated in April each year, with payments changing from July if applicable, taking into account the previous year’s investment performance and provide a monthly pay-out via the payroll on the last working day of each month following retirement. It must be remembered, Crystal Onyx uses an investment linked product managed by AB Global and therefore, investments may go down as well as up. This could be as a result of the market going down or because investments do not perform as well as expected. Crystal Ruby is designed for individuals who wish to keep their fund invested following retirement but allows access to these funds at any point in time, like a savings account. Crystal Ruby offers unlimited freedom of choice, allowing a long term investment with ability to take income when it is required. Withdrawals are limited to one per calendar month, a minimum amount of £100.00 per withdrawal and the option to move to a monthly income at any time using Aqua, Jade or Onyx. Crystal Ruby will be invested in a mix of assets known as a Target Date Fund, which offers the potential for growth to protect income against inflation. The mix of assets (as detailed on the asset allocation pie chart) also spreads the risk across a number of investment classes and aims to grow the Fund, in a controlled manner, to allow for flexible withdrawals whilst retaining a benefit to be passed on to dependents. Individuals can close down Crystal Ruby and switch to another option within Crystal or buy an annuity on the open market. There are no ties to Crystal Ruby and individuals can change their mind at any time. It must be remembered, Crystal Ruby uses an investment linked product managed by AB Global and therefore, investments may go down as well as up. This could be as a result of the market going down or because investments do not perform as well as expected. A dedicated Client Services Manager will be on hand to ensure your preferences, brand, chosen cost structure and investment options are put into place when you become a Partner of Crystal. Branding is an option for employers and Trustees who wish to keep familiarity and consistency for members. Company Pension Scheme has a range of benefits to enable its employees to achieve greater outcomes at retirement. by experts, who are trained and qualified in all aspects of pensions. As a Partner, you have access to online systems where fund values, investment options and performance are available by clicking below. Pricing will be confirmed by your dedicated Client Services Manager upon receipt of requested data. To discuss a quote, please contact a member of the Client Services Team. Highly knowledgeable pensions professionals make up the Governance Strategy Team. The team ensures the Trustee, which is selected from the operating parties, including employer and union representation with an independent Chair, is supported on a daily basis. The responsibility of Trustees and Trustee Boards has increased year on year, particularly in light of the recent Pensions Bill, with the position of a Trustee becoming increasingly demanding. Part of the implementation into Crystal is the transfer of members’ funds from their previous investment manager to Crystal’s investment choices, as selected by the Trustee. This is referred to as an Asset Transition. Before the Asset Transition can proceed, certain aspects need to be considered and decided on. It will be up to the Trustee of the current scheme to decide if a transfer of all funds will be completed with or without members’ consent. This may depend on the rules of the transferring scheme. If members’ consent is required, then a transfer discharge form will need to be completed by every member before the Bulk Transfer can proceed. If it is decided that a Bulk Transfer will be carried out without members’ consent, then the current pension arrangement will need to obtain an Actuarial Certificate prepared by the scheme’s Actuary. It should be decided by the Trustee whether any transition costs or out of market losses will be covered and what those are likely to be. All members should be informed of any intentions and notified of decisions made that affect their pension. The next steps will be to request investment data from the previous investment provider, build an asset transition matrix and obtain information from all investment providers about in species transfer options. (All communications will be sent via email and detail secure log ins to the web service, MAP). Full details of the investment transfer are reviewed by Crystal’s investment consultant and sent to your members in the early stages of the transition. Transitions are carried out as part of the Client Services Team’s duties to enable new clients to begin their ‘Partnership’. The one site, in house feel provided by operational, administration, data, IT and accounting teams, ensures Crystal clients receive dedicated support from the transition period through to the member support, whether it be by online services, email communications or via telephone. Evolve encourage and support all staff to study for professional pensions qualifications. Evolve’s capabilities and systems gives the client and member the confidence that experts are managing all pension administration requirements. Service Level Agreements are tailored to the client’s requirements and targets are set at 95%. Teams are managed by Team Leaders who ensure clients receive a high quality, dedicated service which results in flexibility of service, control of risk, certainty of cost and unrivalled support. Fund accounting is controlled by the Head of Administration and the Treasury Team. Daily reconciliations of bank accounts and investment holdings are automated using our administration system. Evolve’s payroll service allows members who are receiving income from their pension savings to view payments online and receive payslips via digital communication. The system is highly automated but administered by experts, which means that our clients can be confident their members get the right benefits at the right time. Cloud and web based infrastructure ensures data is held safely and securely with fully integrated workflow, document management, letter generation and real-time internet self service facilities for members, employers, third parties and trustees. 2018 © evolve. All rights reserved.